To my knowledge, the only island in Macedonia is Taso/Тasos (Thassos in Greek). I was hoping someone might have some information on the history and ethnology of this island. Macedonian wikipedia mentions that the island used to be of mixed ethnicity and that the Macedonian population were persecuted during the Balkan Wars but I was hoping for some more informaiton and evidence. Macedonian toponyms are also welcome, I know the main settlement on the island is called 'Боровец' ('Limenas' in Greek) but if anyone knows the Macedonian names for the other settlements that would be great. No, it's not. Never heard of this before and couldn't find anything that confirms or suggests it (Google produces nothing). Thasos (by 1900) was a small island with pure Greek population of about 15,000 people and a small presence of Turks (0,3%). Bulgarian statistics should confirm that. During Metaxas dictatorship, it was used for political exiles. There's a toponym Vulgaro (close to the village Rahoni). There's an excellent research in Greek about it, but the file doesn't open. I managed to (somehow) read lot of it in its cache form where some of the Greek characters were corrupted. It has an extended history of the related nearby villages since around 1000 A.D., it probably relates the name with the existence of a Bulgarian “metohi” (distant property of a Bulgarian Monastery) but it doesn't produce a definite conclusion (or at least one I managed to read). This is very good, detailed and extended including the life and times of Bulgarian monks, relocations, destructions and new names per century etc. Another extended article by Hionis mentioned in the Macedonian Wikipedia sources about the Thasian involvement in Macedonian Struggle is also very interesting. Murders of Bulgarians are mentioned, while most of the time it refers to activities of Thasians outside Thasos (e.g. in the districts of Kavala or Serres) I believe some of them are inside Thasos. That may include again Bulgarian and Romanian “metohia” in Thasos as targets. This file also has problems. Actually both files are from the same library (Eastern Macedonia and Thrace Institute of Technology) that doesn't seem to function at the moment. Last edited by Amphipolis; 10-23-2016 at 05:04 AM. I don’t know enough about the island of Thasos except for its close proximity to Macedonia which, in a way, makes it Macedonia’s very own version of Australia’s Tasmania. We don’t hear enough about it as a topic of interest and I always assumed that it was simply because Macedonians have never set foot on it before. My first reaction, when I read LoM’s suggestion that ethnic Macedonians lived on the island as recently as the Balkan Wars was to scoff at the idea. I checked Macedonian Wikipedia and, sure enough, that is exactly what they claim - that before the Balkan Wars, when the Macedonian population was expelled, Thasos had an ethnically mixed population. I checked Bulgarian Wikipedia, which is a lot more extensive than the Macedonian entry, and although I couldn’t be bothered reading through all of it, they seem to corroborate the idea that on Thasos, besides the Greeks, there also lived a Bulgarian population (i.e. Macedonian population). Macedonian Wikipedia backs its claim with the following reference to a book by Κωνσταντίνος Χιόνης, Η ΘΑΣΟΣ ΚΑΙ Η ΔΡΑΣΗ ΤΩΝ ΟΑΣΙΩΝ ΚΑΤΑ ΤΟ ΜΑΚΕΔΟΝΙΚΟ ΑΓΩΝΑ. I clicked on the link but I wasn’t able to make out the microscopic text that came up so I can’t shed anymore light on the matter. Thasos (by 1900) was a small island with pure Greek population of about 15,000 people and a small presence of Turks (0,3%). Many Greeks also call Greece a land with a pure Greek population. I always pause any time I see the phrase "pure [insert ethnicity] population", but I take special precaution when a Greek says it. Also, why am I not surprised? Many Greeks today don't even acknowledge that Macedonians exist in Macedonia; they would never acknowledge that Macedonians exist anywhere outside of Macedonia. This is an ethnic map of Bulgarian propaganda. As you can see it mentions Voulgaro (as Volgaro) in Thasos, but generally leaves Thasos and parts of Pieria (Olympus) outside Macedonia for obvious reasons. And a second Bulgarian one. 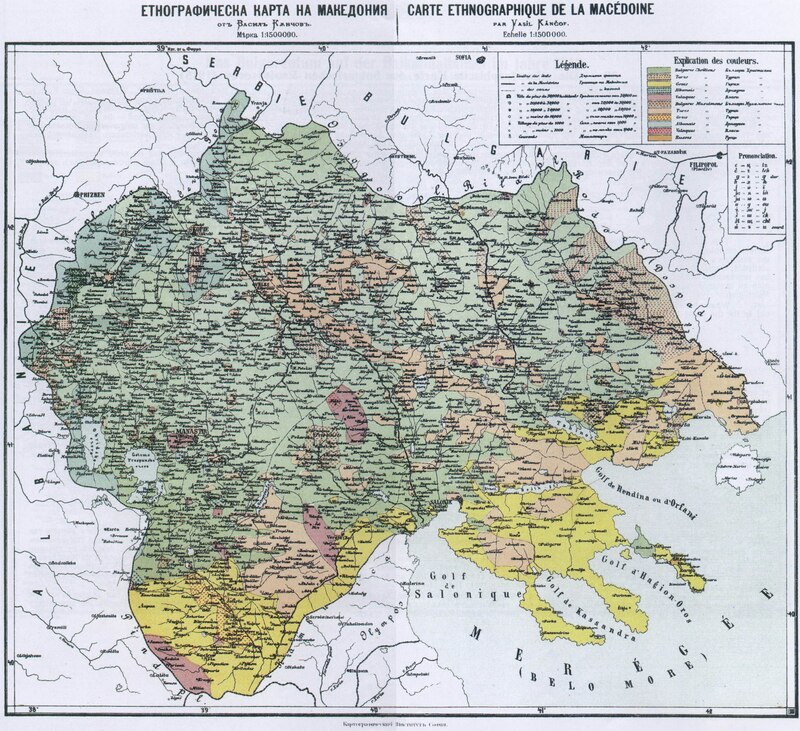 This one has more toponyms (including Volgaro for Rahoni) but no Боровец for Limenas or Thasos. Actually there's no name there (it should be in the NE coast). Last edited by Amphipolis; 10-23-2016 at 12:51 PM. I brought it up because I noticed it is often forgotten and there was a lack of information on it. 'The burning of the dependency of Third-party belt graph in St. George, where three monks lived Bulgarians and prosecution 12-13 some other Bulgarian [Macedonian? ], which were of distributed in cho- lds of Thassos. 'Every Bulgarian [Macedonian?] guerilla leaves without looking behind......Bulgarian rifles......Only Greeks are world renowned. It should be noted that this source is written in Greek so it would be better for someone with greater knowledge of that language to have a look at it but this is the stuff I found of interest, roughly translated. I'll give you the translation of the key sentence that provides the number of Bulgarians in Thassos. Metochia are external properties of monasteries (Bulgarian and Romanian Monasteries of Athos in this case). "Mavromichalis called Psarianos and asigned him the blowing of the Romanian metohi in Potamia, the burning of Zographos metohi at St. George, where 3 Bulgarian monks lived and the persecution of about 12-13 other Bulgarians, who were dispersed in the villages of Thassos". This is during the Macedonian Struggle (1907-08 I think), it provides the names and professions of Bulgarians that were assassinated or escaped, the assassins, the villages etc. Last edited by Amphipolis; 04-25-2017 at 07:09 AM. Bulgarian statistics claim there were over 21.000 people there. One side here is lying, you can't both be right. I'd also point that there are around 13.000 residents there present-day. What happened since 1900? Population burnout?